Since their recent releases, Mirror's Edge and Prince of Persia have both garnered abundant attention for their stylish visuals and unique platforming, and they've both come under fire from reviewers and gamers for certain design elements. Take a closer look at the complaints leveled against each game, and you'll see a curious set of contradictions. Mirror's Edge and Prince of Persia have a lot in common. Both take place in beautifully detailed environments. They both rely on lengthy platforming sequences punctuated by moments of combat. They also demand that players retry certain sequences or skills until they get things right. There are some significant and unmistakable differences, though. Mirror's Edge revolves around intrigue and corruption in a creepily sanitized, near-future authoritarian society. Its events are viewed from the first-person perspective of its free-running protagonist, Faith. Prince of Persia, in contrast, takes place in a dramatic fairytale kingdom where we see the Prince in third person. The Prince benefits from the company of a capable princess, Elika, while Faith must attempt to cheat death alone. The most notable difference between the two games, at least in terms of basic game design, is how each game handles player failure. In Mirror's Edge, mistakes usually mean certain death. Faith is constantly leaping over chasms and across rooftops, and a poorly-timed lunge or grab usually results in a horrifying first-person scene in which the passing scenery becomes a blur, the wind starts to whistle at a terrifying pitch, and Faith hits the ground with a sickening crunch. Gunfire is similarly deadly to Faith. In Prince of Persia, you can't die. When the Prince misses a ledge or jumps in the wrong direction, he begins to plummet toward his demise. Elika intercedes, though, pulling him back to the nearest piece of level ground with a quick burst of magical levitation. 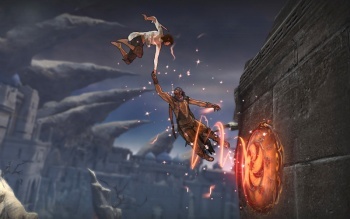 The scene that plays in each death-defying instance includes a close-up of Elika's and the Prince's interlocked forearms and wrists as she draws him back from death. Elika employs similar abilities to save the Prince during combat. It's these core mechanics-the Prince's invulnerability, and Faith's constant deaths-that have provoked the ire of many gamers. To hear some gamers and reviewers tell, the lack of death in Prince of Persia robs the player of any real sense of consequence, and by extension, any real sense of satisfaction. Prince of Persia is, purportedly, "one of the easiest games you'll play all year." Some reviewers have blamed Elika's lifesaving abilities for "a diminished sense of reward," a world "devoid of challenge," and an experience that is free of frustration, but "also free of joy." With Mirror's Edge, we find exactly the opposite complaints. Faith's frequent fatalities are "infuriating," "punishing," and "overly frustrating." The checkpoint reload that the player endures with each death is "illusion-breaking," "annoying," and causes "fatal breaks in the sense of flow." These contradictory complaints seem especially odd when you consider that the end result of failure in each game is essentially identical, from a practical standpoint. In Prince of Persia, you're forced to endure a brief animation as Elika yanks the Prince back to the nearest flat surface. In Mirror's Edge, you're stuck with a very short load screen before you begin anew at the nearest check point. There's no significant difference in the length time it takes each game to reset the player.